At this time of year, as the school calendar winds down, schools take time to recognize their students with a variety of assemblies honoring everyone from honors students to student athletes. However, Seneca High School puts together a different ceremony each year that acknowledges students for their character, charm, integrity and humanity. 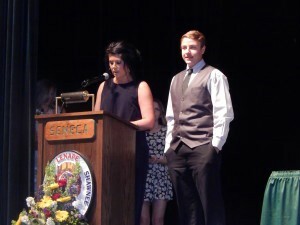 The Seneca Renaissance Club’s 12th annual People’s Choice Awards was held in the school’s auditorium earlier this month. “Tonight, we’ve gathered for a unique and extraordinary award show,” said Kathy Donoghue, master of the ceremony, media specialist and assistant athletic director. The people’s choice is unique in the sense that it is an opportunity for staff members to celebrate the student who has dazzled them with their character. “You, my fine people, are truly special,” Donoghue said. From a pool of more than 1,200 students, just 54 were chosen for this prestigious award. Each of these 54 were recognized individually with some kind words by the staff member who selected them and given medals they will be wearing at their graduation. Some of these students were recognized for one-time interactions or random acts of kindness, while others were recognized after a teacher had gotten to know them over their four-year career in high school. All the stories were unique in one way or another, and it made for a colorful ceremony that drew numerous emotions out of audience members — from coaches who have had the pleasure of watching a player grow to teachers who have had their lives changed by a particular student’s presence on a daily basis. There was even a family moment shared on stage this year. When Bonnie Horner presented her daughter with her people’s choice selection, there was not a dry eye in the auditorium. Julie has persevered through some tough times battling medical struggles and never complained about it taking some of her beloved activities away. In fact, she strives to one day become a doctor to level the playing field for those who also find themselves or their loved ones in a similar situation. “I cannot think of a better person for this award. I love you so much,” Horner said. The crowd burst out in laughter as Renee Collins presented two separate people’s choice awards. Hartman and his cell phone both marched up to the podium with no shame, very proud to have been nominated by his teacher. Nonetheless, she was thankful for Hartman brightening her day by being himself and for his ability to not only take a joke, but to also fire one back her way. This was the second to last ceremony of the year, followed by the Senior Athlete Awards on June 2. However, many teachers admitted to this being their most beloved end-of-year ceremony due to its uniqueness. “Teachers assess you by a test grade or class participation. Tonight, you all get an A in human relations,” Spector said.